Have you ever felt like Sarah? It never ceases to amaze me how often I get this question in my travels around the country, interacting with businesses and professional organizations. I am certainly delighted by people who want to learn. But I am also discouraged because the rationale for their question is most likely the result of getting little guidance by their leaders at work. I normally recommend a good book for starters. However, a much better, long-term solution to the problem is what I will highlight in this article. The recommendation described here is a proven fundamental the army has used for decades by thousands of leaders. The army’s Field Manual 6-22 Foundations of Army Leadership (12 October 2006) is an outstanding source on leadership. The army continues to update this manual with each version getting better. 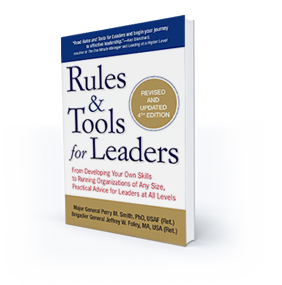 This manual highlights essential leadership competencies that define what success looks like. The army’s leadership manuals combined with the competencies listed on the annual performance appraisals for leaders make it abundantly clear what is most important to members of the army team. Every organization should highlight core leader competencies that every leader needs to achieve as well as the additional competencies commensurate with one’s level of responsibility. When competencies are not identified, people do not know how success is defined, difficulties persist for leaders in effectively coaching their people, and training programs become aimless. Identification of competencies becomes the easy part; the much tougher task is to gain proficiency in them through training, tireless practice, and feedback. Learning to lead is a fulfilling and enriching experience. Read on to learn more about each of the three elements of this process. Smile! Enjoy the journey! Clearly defined core leader competencies shine a bright light on the fundamentals of solid leadership for every leader in the organization. In the army’s 2006 field manual, as an example, eight core leadership competencies along with corresponding behaviors are identified. Examples for consideration include: commits to learning, seeks self-awareness (strengths and weaknesses), possesses interpersonal skills, effective in oral and written communication, solves problems, and takes initiative, listens with intent to understand, develops others, motivates, builds team, holds people accountable, instills trust, shows gratitude, builds confidence, and builds relationships. At lower levels in the organization, a leader has daily contact with most of his/her people. These are front line and middle level managers who are engaged in day-to-day operations, where the action is. The environment is generally less complex than at higher levels. Representative competencies at these levels include: coaches subordinates, achieves results, sets clear goals, makes good decisions, holds people accountable, delegates effectively, manages conflict, implements policies and procedures, and enforces discipline and adherence to standards. As one progresses up in the organization, leader responsibilities and authorities expand dramatically. At the senior or executive level, the environment is characterized by increased complexity, higher risk, greater uncertainty, less direct control over subordinate echelons. Representative competencies at these levels include: sets vision and mission, designs and implements strategy, communicates intent, achieving executive presence, designs organizations and structures, leads change, exercises humility, clarifies roles and responsibilities, synchronizes actions, develops policies and procedures, builds partnerships, and shapes the organization climate and culture. There is overlap, of course. The key is to identify the most important competencies for your people in their positions in your organization. The final task in this process is for the CEO or business owner to ensure programs are established to help people learn the behaviors that enable competency achievement. Education and training is important, as is an effective feedback environment that enables learning. For example, the competency of “listen with the intent to understand” has behaviors that might include: look the person in the eye, take notes, don’t interrupt, and repeat back to the person what you heard. These behaviors help you become proficient in the competency of listening. Document the competencies in your employee handbook so people know what the expectations are of them. Put systems in place that help people learn how to be a more effective leader. Make competencies visible in your annual performance appraisal system to really bring them to life. Over 30 years of counseling my subordinates and being counseled by my superiors taught me how valuable these experiences were in my professional development as a leader. People of all generations, including millennials, are seeking ways to grow as leaders. Investing in a program that helps them can be a catalyst for attracting and retaining top talent. 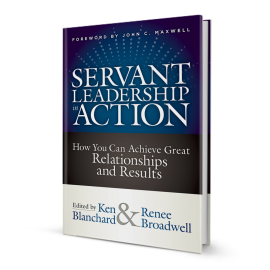 Identify the leadership competencies needed to be successful in your profession. Seek growth yourself and help those in your organization so they do not have to ask others how to get started, like Sarah. Now armed with this new knowledge (or a reminder of old knowledge), what new decisions or actions are you going to take?